"More Travelers Requesting Up-Close-And-Personal African Wildlife Experience"
"Teenagers watch heart surgery in Argentina"
Thomas Pastrorius, Head of Global Recruitment for Projects Abroad, was a guest at the Rudy Maxa’s World radio show with Rudy Maxa. The interview starts at 24:08. "Alternative Spring Breaks 2015: 5 Volunteer Opportunities For Building Homes, Teaching Youth At Cool Destinations"
"Strategies for a Gap Year"
"Projects Abroad NGO repaints part of Lautoka Hospital"
"Grimsby team ready for mission trip"
"Combating the global epidemic of prison overcrowding"
"Maria Mulindi is Program Manager for Projects Abroad’s Human Rights Project in South Africa (PAHRO), and her experience working with refugees and, more recently, Pollsmoor inmates has given her excellent insight into the prison underworld and the ramifications of the overcrowding problem." "Desire to conquer poverty prompts Fijian trip"
"One student’s desire to help others is taking her to Fiji. Maddy Bunton, 16, is traveling to the island in December to spend two weeks with disadvantaged locals. Traveling to a village near Pacific Harbour she will be teaching English, renovating buildings, and working with children." "Projects Abroad hailed for volunteerism"
"Ministry of Education director in Region 5, Dr Nadine Leachman, has lauded the non-governmental organization Projects Abroad Jamaica for what she described as "volunteerism at its highest level." "Christiana Fattorini ’15 finds a passion for public health with Projects Abroad"
"As a volunteer for Projects Abroad, Fattorini became aware of the importance of education in public health. It was a turning point for her career path. ‘I loved working in the hospital, but I found most patients returned for preventable health issues,” said Fattorini. “I realized there is a great need for education and resources in public health." "Volunteerism: For Those Looking to Travel and Give Back"
"If you’re looking to make an impact on the environment, Projects Abroad is playing an important role in contributing to the preservation of the earth. With ten Conservation & Environment projects on four continents, Projects Abroad is making great strides in conservation work and promoting environmental awareness in communities around the world, with the help of dedicated volunteers." "Made possible through the company Projects Abroad, Kadisha Mitchell received a total of J$30,000 to help offset school fees, among other expenses." "Children’s Day Enjoyed by Local Kids"
"Projects Abroad Fiji was happy to sponsor the Digicel Bula Festival 2014 Children’s Day which marked the opening of the Festival. Volunteers organized free games and fun activities for the children of Nadi to enjoy." "Geneviève Therrien est conseillère de programmes chez Projects Abroad au bureau de Toronto. Elle est l’invitée au micro de Raymond Desmarteau." "Summer internships allow students to sharpen skills, explore the world"
"These programs are designed to help graduates develop skills in a particular field by working alongside local professionals an intern and helping as needed. With internships in many fields, graduates from all backgrounds are sure to find something to suit their interests and career plans." "Delay college for a gap year"
"As a growing number of students are discovering, taking time off between high school and college can not only make you a more interesting person, it also might make you a better student. As Hage says, "There is no better education than having the world as your teacher." "Volunteer in the field and the country of your choice"
"The Week You’ll Never Forget"
"Travel News, Tips & Tricks for Spring 2014"
"’The residents were appreciative of the care and attention given to them; many have grown accustomed to the loving care of volunteers who are placed here. Companies like Projects Abroad help us fulfil the mandate of the institution to cater to the total well-being of the residents,’"
"’We shadowed doctors and got to learn about the health care and medical system within the main capital," he said, adding that he got to experience close-up observations of a gall bladder removal surgery as well as surgeries on an eye, heart and prostate. He noted that the country's health care system ‘is very understaffed.’"
”’We have been taking out these programs mainly in the second term of holidays, since 2011 and this helps us as teachers and our children to learn more from these students that are here and willing to share what they know and in return it builds their confidents to be future teachers’”. “Gretchen McCarthy, a sophomore from St. Louis, Mo., taught French and English this summer to children in Saint Louis, Senegal. McCarthy worked as a volunteer for a month in a care centre that offered classes to children who do not attend school. Her project was part of the Projects Abroad program. A French and Spanish double major, her project goals were to figure out if she truly wanted to pursue a career in education and to push herself out of her comfort zone." “More students now decide to go travelling as a gap year experience before university. Dr Peter Slowe, director of Projects Abroad, says: ‘A shortage of places on some courses, coupled with considerable increases in university fees, volunteering for philanthropic projects abroad becomes an attractive option. Many young people see volunteering in the Third World as an excellent way to step off the educational treadmill and broaden their outlook, life skills and general education while enriching the lives of others. Students return from volunteer placements more mature and more confident, and ready to tackle university studies.’"
“’The project involves providing loans and business training to women that own their own business," says Justin Pressley, who recently volunteered in Tanzania. "It requires volunteers to travel to each group once a week to collect installments, monitor their processes and provide business training and tips. Projects Abroad makes a difference by providing the money for the loans and training the local women so they can make money to improve their lives and existing business.’"
Local Jamaican television features a success story from Projects Abroad’s Building project in Jamaica. Zadia's story is a beacon of hope, but for many people in Africa healthcare, is still dangerously out of reach. From grandparents such as Zadia to tiny babies, many are in desperate need of help. As well as the assistance provided from governments through overseas aid, many more Africans can be helped by volunteers with organisations such as Projects Abroad Ireland (https://www.projects-abroad.ie). “Former High School Special volunteer Victoria H. offers some insight on why she chose to volunteer in India. ‘For as long as I can remember, India has always been a country of great fascination to me,’ she explains. ‘However, when searching for a summer program to participate in before going into my senior year of high school, India was not the first criteria that registered in my mind. Rather, it was the chance to experience medicine first hand. The fact that this program allowed me to observe medicine, while also being fully immersed in the Indian culture, is precisely why I chose this trip with Projects Abroad.’"
"Carin Postal graduated from Lake Mary High School in 2009 and was quickly off to Carleton College in Northfield, Minnesota, with plans to be an art history major. She never would have envisioned herself working in the labor ward of a hospital in Tanzania, helping nurses deliver babies. But that’s exactly what Carin found herself doing this past winter break. As part of a one-month medical assignment with Projects Abroad – one of the world’s largest volunteer abroad organizations – Carin spent most of her time volunteering at a local hospital in Tanzania’s largest city, Dar es Salaam, while doing research for her college thesis." "Alternative Spring Break: Beyond Beaches and Body Shots"
"Alternative spring breakers might come back with a different set of stories than their beach-going peers, but they are no less memorable. Based on her experience in Costa Rica, Hart recommends diving in. ‘I would tell anyone who is considering alternative spring break to just go for it, because it will change your attitude towards any new experience you will encounter thereafter.’"
"Summer Plans for Far East Adventures with Projects Abroad"
"It is a popular misconception that volunteering can only be undertaken in a gap year. Projects Abroad also offers volunteer programs that run during the summer vacation…Volunteering is an experience that can provide students with a wealth of skills. As well as the practical skills, for example, learned during child care or journalism projects, volunteers also see increased confidence and the ability to work with a diverse range of people." "Projects Abroad volunteers among those making a change in Ethiopia"
"Every year, organisations such as Projects Abroad send hundreds of volunteers to Ethiopia to work in disadvantaged areas.They get involved in work such as teaching the next generation of Ethiopian children, lending a hand in care centres, and even providing medical treatment." "Two Decades of Global Service with Projects Abroad"
"We’ve developed a work ethic around the word ‘worthwhile’. Each project should be worthwhile for the volunteer, worthwhile for our partner organizations, and worthwhile for our host families. It’s a simple idea that has guided us well in this rapidly-changing field." "Student Finds Second Home While Volunteering"
"I’ve done Kilimanjaro, gone on Safari and day trips, but my most memorable experience is my walks to and from school. The children made my day, every day. They couldn’t pronounce Kayla so they called me Kila. I miss hearing them calling me ‘Kila! Kila!’ and just wanting to chat, dance or braid my hair." "Students invest in Projects Abroad and other volunteer programs to boost their higher education prospects"
"Charlotte Bonner, who undertook a 2-week special project in Medicine in India, says: ‘The only real way to know what a country is like is to immerse yourself in its culture, soak up the atmosphere and get amongst the people. This is exactly what Projects Abroad allows you to do as you are not seen or treated as a tourist, but as a member of the community.’"
"Projects Abroad PRO offers new ways for people to give back more than money"
"In only one week, we have seen and done so many things – we have learnt about many new techniques and theories and have found it all fascinating. Volunteering abroad allows you to completely immerse yourself in the local culture of your location." "Organising Help for Developing Countries"
"Projects Abroad has been organising volunteer projects, work experience and gap year placements for more than 20 years. The company, which was founded in 1992, has sent more than 50,000 volunteers to more than 25 developing countries across the globe. The price of each project includes accommodation, food and transfers as well as travel and medical insurance." "’I think in our culture, there’s a subliminal connection between a country where your help might be needed and somewhere hot. I think people might see places that are milder or colder as more developed places, which is not necessarily true’ says Tom Pastorius Jr., vice president of Projects Abroad, which offers medical and health care internships in Ulaanbaatar, Mongolia, where temperatures can drop to minus 40 F, as well as Romania and Moldova, which can hit zero in the winter." "8 Travel Resolutions Worth Keeping"
"Help those less fortunate. Volunteering as a family while on vacation is an easy way to re-connect with each other…Really want to dig in to help those in developing countries? Projects Abroad places thousands of volunteers every year." "While in Argentina, Nicole volunteered at a children's home. ‘For Christmas,’ she says, ‘I asked my parents to please tell my family that instead of buying me Christmas presents that I will open a month late, could they please give me the money so that I could spend it on presents for the children, and so this is what I did.’"
"Volunteer Tells of Eight Week Fiji Experience"
"I would recommend this company to anyone, of any age or background. My fellow volunteers were managing directors, chartered accountants, sixth formers, graduates and teachers back home, from places such as Australia, Japan, Switzerland, Portugal, Germany, Belgium and Scandinavia. This trip was the best decision I ever made, and it has given me the impetus to volunteer and travel again. I arrived in Fiji with little, I came back home with so much more than I had bargained for." "Projects Abroad appoint new dedicated Medical Electives Coordinator as awareness grows over the importance of making an ethical choice"
"’Our medical programs literally span the world, from South America to Africa and China,’ said Lauren Dumbleton, the new Coordinator. ‘As a company we have been operating for over 20 years, bringing together skilled and general volunteers with the communities who most need them. Our message to students seeking help with tailor-made medical volunteering placements is: It can be a stressful and competitive process – so let us do the hard work for you. Whether you’re on your way to becoming a doctor, surgeon, dentist, nurse or midwife, our experience in delivering specialist, supportive placements means we can offer a holistic but results-driven elective.’"
"Success in Africa leads volunteer abroad organisation to roll out microfinance projects in four other destinations"
"In Tanzania, volunteers quickly realised the concept of ‘business’ is not really comparable to that of business in the western world – but that that in itself had the potential to be a positive thing. ‘I began to see the positive sides of the lack of development in Tanzania, namely huge spaces for new businesses, possibility for improvement of working processes and innovation,’ said volunteer Franz Jaenecke, who worked alongside the River Side Women’s Group in Ngaramtoni, a poor suburb of Arusha." "Alternative Spring Break Trips Projects Abroad Adds New Program in Jamaica"
"’Since we started running the Alternative Spring Break Trips a few years ago, we have seen a tremendous interest from students all over the country,’ says Thomas Pastorius, Jr., Vice President of Projects Abroad. ‘Volunteering abroad is a growing trend among young students looking to give back and do something worthwhile over their short spring breaks. We are excited to offer additional programs to help allow more of these motivated and compassionate students to achieve this goal and serve local communities abroad.’"
"International Development Officer for Projects Abroad, Anne Buglass who is on island, said that choosing to have Samoa included in their projects was because the agency felt Samoa would benefit from it. ‘When we are looking to set up projects in a new destination, we want to identify places that we feel could really benefit from some extra assistance in the fields that our volunteers want to work." "Karishma Gets the Word Out"
"During the devastating floods this year, volunteers from Projects Abroad made it their top priority to collect funds from a door-to-door appeal for their host families who were affected. Karishma says the fact that they had gone out of their way to lend a hand during a national disaster was truly motivational." "Understanding New Cultures With Projects Abroad"
"In addition to their robust presence around the world, Projects Abroad embraces a very high standard of volunteering. They work with local people whenever possible, supporting local economies by hiring local workers, a practice that must inevitably make Projects Abroad stronger." "Project Abroad Launches Their First Volunteer Trip to Samoa This Fall"
"Project Abroad, which offers short-term international volunteer opportunities for all ages, has recently announced they will host their first trip to Samoa this fall. Volunteers taking part in Project Abroad's inaugural trip to Samoa will spend most of their time in the capitol city of Apia, where they work with a local staff to help educate and care for children." "Gap year case studies: archaeology in Peru"
"I had just got the offer of a place and so the archaeology project appealed. It was a choice between Peru or Romania and I chose Peru because Romania was a bit too close to home. I originally only intended to stay for two months but ended up staying for eight. I didn’t want to go home!" "With Thoughts Turning to Back-to-School Season, Projects Abroad Reveals What Really Matters to Students when It Comes to Mandatory Volunteering"
"Most young people have a positive experience when completing their mandatory community service, partly because they believe they’re making a positive difference to lives and communities, and partly because they feel they’re contributing to their self-improvement and career prospects." "For those who vacation there, the Pacific Island nation of Samoa is a paradise. But the country is also on the U.N.’s list of least-developed nations, and there is a great need amongst some of the islanders, especially in the main city, Apia. Now Projects Abroad, a global leader in short-term volunteer programs, has added Samoa to the already lengthy list of countries in which they operate. Students interested in volunteer work in Samoa would primarily be assisting with education and childcare in schools and care centres." "Volunteers Needed on Microfinance Project in Senegal"
"It was a delight to see the faces of the Talibés living in grueling poverty listening to an opportunity of a life-time being presented to them,’ says Max Wieland, who recently completed time on the Microfinance project in Senegal, an experience he calls ‘genuinely remarkable.’ ‘I distinctly remember one Talibé coming into the office to have his interview with the biggest smile on his face and a sparkle in his eyes, merely delighted at the opportunity he now has,’ Wieland continues. ‘I was so pleased to be involved in shaping and realizing his dreams and ambitions." "Skilled volunteers prove their mettle in rescue of Ghanaian child trafficking victims"
"Volunteers came from a range of countries and with a range of experience. Patrice Van Zimmerman, from the Netherlands, is a professional counselor and therapist, professions that are not common in Ghana. She was keen to emphasize that, as well as sharing her skills, she also learned a lot in her time as a volunteer. ‘I have been lucky to work with the children involved in this particular rescue campaign and local professionals, whose work to stamp out trafficking will be ongoing,’ said Patrice. ‘My training meant I was able to bond with the children and speak to them about their trauma – as well as help them with their homework! In the months that I’ve been here I’ve noticed that there are things people in Ghana know or do better than we do in Europe, so for me it has worked as an exchange. The experience gave me the feeling that I really can make a difference." "10 of the Best Volunteer Abroad Organizations"
"Projects Abroad is one of the more large-scale volunteer abroad organizations out there; it matches volunteers with a tremendous range of projects worldwide. According to their website, they cater to volunteers aged from 16 to 75; as it turns out, there's a growing interest in volunteer abroad projects among retirees and career breakers." "Volunteer in Samoa with Projects Abroad"
"It is always exciting to help bring volunteers into new countries,’ says Projects Abroad Vice President Thomas Pastorius, Jr. ‘Our model of having directly-employed staff recruited from the same communities where our volunteers work has proven effective and sustainable. Over the last 20 years we have helped over 50,000 volunteers of all ages perform worthwhile services in developing societies, providing local employment and injecting millions of dollars into emerging economies in the process. We are pleased to expand this impact to Samoa." "Projects Abroad UK Fund Fact-Finding Mission for Top Seahorse Experts in Order to Re-Focus Southeast Asian Conservation Project"
"Very little is actually known about seahorses in the wild, so to have Neil and Kealan visit the project, and to enter into a partnership with The Seahorse Trust, is an honour for us,’ said Projects Abroad’s Cambodia Project Coordinator Carly Atkins. ‘Their visit meant that we were able to restructure our work in this area so we can conduct some really important research and understand the local ecosystem as a whole.’ With millions of seahorses used in the traditional medicine trade every year, illegal fishing and trade is a constant threat, with some conservationists believing that the species could be extinct within 10 years. As well as cleaning up the beach and monthly reef surveys, volunteers will now be involved in specific tasks such as locating and identifying seahorses and helping to preserve them and their habitat from, for example, trawling. Through the partnership, the experts will remain involved in the implementation of the research project, along with Marine Conservation Cambodia." "Volunteer vacations aren’t just for grown-up with professional skills. There are programs out there designed specifically for teens where they can work with local communities and get a great experience of a lifetime." "Make a change with Projects Abroad!" "When filming volunteer work for Projects Abroad we visited Fiji, Ghana, Tanzania, Shanghai, India, Nepal, Peru and Costa Rica. Every single time we filmed for this organization, we had a great experience and we see what people can do for others with just a little help! All destinations we filmed were beautiful and we can recommend all of them to you." "Developing World Experience – Placements with Projects Abroad"
"Projects Abroad organises elective and pre-clinical placements across 20 developing countries. Medical students from all round the world travel to work in a variety of settings across Asia, Africa and South America. 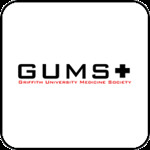 The placements are designed to be educational and practical while also offering a chance for students to immerse themselves in the local culture and explore the country while working alongside medical students from all round the world." "As stats show recession-related increase in career breaks, Projects Abroad PRO director says volunteering demonstrates personal qualities and boosts CVs and confidence"
"Placements in fields such as business development, engineering and human rights often attract volunteers with quite a lot of experience,’ said Scott. ‘People travel more than they did in the 70s and 80s and there’s a sense that the world is a smaller place. But in some countries it’s not a ‘fair’ place. Volunteers want to put their experience and expertise into practice where the benefits of their input will be real and tangible. If they’re between jobs, it also gives them an opportunity to show how proactive, flexible and, ultimately, employable they are." "Projects Abroad PRO kick off South African human rights campaign with an appeal for more qualified legal volunteers in South Africa"
"This month, Projects Abroad PRO – whose work to match qualified volunteers to relevant projects enables them to make a difference to some of the world’s poorest communities – are launching a campaign aimed at UK legal professionals. In a country where the abundance of natural beauty lies in stark contrast to living conditions for many, the campaign will highlight Projects Abroad PRO’s law and human rights work and encourage professionals to get involved." "Projects Abroad gets support from 'partners' in Manchester"
"Three organizations in Manchester have taken the lead in partnering with non-government (NGO) body, Projects Abroad, in promoting HIV/AIDS awareness as they embark on plans to build a related facility for children in central Jamaica. Northern Caribbean University (NCU), the Greenvale Community — through its taxi operators and football team — and Morrison's Variety Store have made their input by adopting the project for different months.Manchester High School Cadets march for the Immunitiative Project recently.The residential facility for children with HIV/AIDS to be built in Manchester by Projects Abroad is being promoted as the place where they will be able to REST (Restore Empower Serve Train). Projects Abroad Jamaica, through what is referred to as an 'immunitiative project', aims to provide an ‘ideal’ environment in Belretiro, Manchester for about 40 children living with HIV/AIDS." "Projects Abroad helps US teens volunteer overseas"
"Officials at the agency said they expect almost 1,000 students to take part this summer in the group's ‘High School Specials,’ which are structured programs for high school students…More than 40 programs are scheduled this coming summer, including in Ghana, Jamaica, Costa Rica, South Africa and China." "In some cases, prestigious colleges are not only encouraging a gap year, but funding it. Both Princeton University and University of North Carolina at Chapel Hill aid students in setting up a gap year prior to coming to campus. ‘We are seeing that the drive for a gap year is coming from the universities themselves,’ says Tom Pastorius, vice president of Projects Abroad, an organization that helps kids set up gap years." "More High School Students Choosing to Volunteer Abroad"
"Projects Abroad, which recruits thousands of volunteers worldwide to volunteer in developing countries, reports that increasing numbers of high school students are choosing to volunteer abroad this summer. The leading international volunteer organization is expecting almost 1,000 students to take part this summer in their High School Specials, which are structured programs for high school students." "High School Students More Interested in Volunteering Abroad"
"The most popular option for students is the High School Specials, which are targeted directly at this demographic and allows students to broaden their perspective on the outside world, in addition to providing them with valuable extra-curricular credits for their college applications." "Voluntourism Spotlight: Projects Abroad in Mexico"
"’Words do no justice to the views and scenery out there, one of the most beautiful places I’ve ever been. I never thought I’d wake up in the morning, step outside and have a cowboy ride over to see how things are going.’"
"How to disappear for a year"
"Says program advisor Craig Ferriman, ‘Teaching abroad is a great way to combine seeing another country and really helping out. In many of the countries where Projects Abroad work the local schools really struggle to get people who speak English to work with them as they can be paid more to work as a tour guide or in a local hotel.’"
"Taking a gap year helps a student to get the most out of university"
"There are many benefits associated with taking a gap year between school and university in terms of attitude, work ethic, maturity and the perception of others…Ian Birbeck, recruitment director at Projects Abroad, said: ‘It gives students time to evaluate what they really want to do away from the pressure of exams and school. Universities have stated that the dropout rate from students who have taken gap years is less than those that go straight to university.’"
"Rewarding Spring Break Alternatives Abroad"
"Texas is urging spring breakers to avoid popular spring break destinations such as Cancun, Acapulco, Cabo San Lucas, and Tijuana because of drug-related violence and criminal activity…Don’t let this get you down, your spring break can still be saved! Project Abroad is taking last minute signups for alternative spring break trips where teens can get away, experience and give back." "College students on a mission to make a difference"
"Projects Abroad announced that there is still room on some of the Alternative Spring Break Trips for college students who want to make a difference during their week off from studies. ‘Projects Abroad provides worthwhile volunteer projects rooted in the needs of the local communities in which we work,’ says Thomas Pastorius, Jr., Vice President of Projects Abroad. ‘Even with just a week, volunteers can impact these communities and mature themselves in the process.’"
"When Emily Kaufman went to South Africa in August for a volunteer outreach trip, she didn’t know she would do more in five weeks than all her 17 years prior. ‘I wanted to experience it the best I could,’ she said. Whether climbing the country’s iconic Table Mountain or working with children living in poverty, Emily came home with a new perspective on life." "Chester teenagers take on Vietnam mission for Projects Abroad"
"Two teenagers from the Chester area are preparing to head off to Vietnam on a charity mission. Dona Kumar and Felicity Elsegood, both 18, will be volunteering with the global organisation Projects Abroad…Peter Slowe, director of Projects Abroad, said: ‘We are really pleased Dona and Felicity are doing this.’"
"Challenge of trip to Africa"
"Our speaker for the evening, Anne Moffatt, came to tell us about her trip to Ghana last year. Anne is a practising midwife and works at the Princess Anne Wing maternity hospital of the Royal United Hospital in Bath…Feeling in need of a challenge, she was offered six weeks in a maternity hospital in a small town north of Accra, in Ghana. A ‘challenge’ is probably the understatement of the year." "Former Mountain Vista soccer player finds new skills in the sand"
"Johnson, an International Business major at the Nebraska-located college, travelled to Brazil this past summer and spent three months engaging in a lifestyle that has forever changed her life. Projects Abroad was her home away from home. Her responsibilities included volunteering at two different projects. Daytime hours found Johnson working with 12-18 year-old soccer players, in a project called Gerson, and evening hours she spent playing with teams on a Brazilian beach. ‘My most important responsibility was to work with the kids, gaining their trust while understanding their culture,’ Johnson said." "Gap-year placement has become a mini-industry over the past few years. For a fee, various charitable organisations help gap-year students to work in childcare centres, on environmental projects or teach English. Some operators do it better than others…Considering this - and I have a daughter in the same position as your son - I would have no hesitation putting Projects Abroad at the top of my list." "Grey pound joins the queue for a gap year with purpose"
"A desire for life-changing travel experiences has seen teenagers heading off to every corner of the globe, and the same impulse is now fuelling the travel market that serves the older age group…’While younger people still take the majority of our placements, we are getting a lot of older volunteers going away,’ says Ian Birbeck, marketing manager for gap year and volunteering company Projects Abroad. ‘We had one chap whose son was doing a teaching course in China, so he decided to go to Romania to teach kids. It was a case of: ‘Well... if the kids are doing it, let me have an opportunity’." "Volunteer to Juice Your Career"
"Got a bad case of the ‘Why am I working here?’ midwinter blahs? Feeling stuck in a career rut? The solution might just be found in a corporate volunteer program. Less expensive than a fancy vacation and more invigorating than a spa day, these programs can make you feel better about yourself, look more kindly upon your employer, expand your professional network, and discover new meaning in your career." "Projects Abroad Announces its 20th Anniversary"
"’We are grateful to our thousands of volunteers who have given their time on our projects over the years and are eager to help many more partake in the invaluable experience of international volunteer work,’ says Thomas Pastorius, Jr., Vice President of Projects Abroad." "60 Links Every Student Traveller Needs"
"Projects Abroad. Both internships and volunteer programs are available through this organization, which annually sends over 8,000 participants to five different continents for different social, linguistic, educational, and ecological causes. Trips last between one week and five months, and they do offer alternative spring break options as well." "Summer classes for our young"
"A team of volunteers from abroad is conducting summer classes for primary school students in the capital city. Organised by Projects Abroad - Fiji, the summer classes started at Suva Primary School in Samabula on December 5 and ends today…Projects Abroad - Fiji regional co-ordinator Chinnamma Reddy said the summer classes were basically for education, fun and games. Ms Reddy said the children were taught how to solve mathematical problems. ‘There is a lot of emphasis on education plus fun things for the children by volunteers from Germany, Canada, United States of America, Australia and Austria,’ she said." 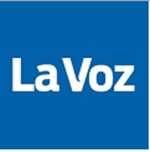 "Voluntouring offers new way to experience Mexico"
"A volunteer vacation is one of the best ways for a habitual sun-and-fun vacationer to break out of the rut; for a first-timer, it's a safe and rewarding introduction to the Mexico that exists in the real world, outside the all-inclusive resorts' walls…Projects Abroad: Widely varied programs in Mexico that can be as short as one week, along with excellent reviews, put this one at the top of the list." "Volunteering takes on new meaning overseas"
"Projects Abroad director Will Pashley says Ms Capper is one of a growing number of people loading their backpacks and heading to faraway places in search of personal discovery and cultural enlightenment. Last year, more than 10,000 Australians made such a trek. ‘You always get more out than you put in,’ Mr Pashley says. ‘You experience life in a developing Third World country that has different cultural practices to your own. You make connections with local people that you would not if you just, say, went on a safari in Africa or a travel tour.’"
"The University of the South Pacific collected 112 pints of blood early this month in its most successful drive ever to collect the gift of life…The USP blood drives have been organised by USP Campus Life and the USP Sai Youth Wing of the Sathya Sai Service Organisation of Fiji in conjunction with the USP Students Association and supported by Vodafone. USP has volunteers from Projects Abroad who have joined this year." "Backpacking Adventures Get Kicked Up A Notch With ‘Nomad Projects’"
"Nomad Projects allows the experienced backpacking adventurist to see Morocco or Mongolia through the eyes (and lives) of the locals. Offering backpacking trips hosted by nomadic volunteer families whose ways of living haven't changed in thousands of years, adventurists looking for a unique way to check out the Moroccan Sahara or the Mongolian Steppe will get the opportunity of a lifetime thanks to Projects Abroad." "Amazing teen travel to Amazon"
"Her two-week stint in the Peruvian Amazon led Brampton teen Jessica Da Silva to connect with wild animals in an up, close and personal way. Da Silva, 15, spent her time volunteering at the Taricaya Ecological Reserve (TER) near Puerto Maldonado in Peru, with a team of Projects Abroad volunteers…’The trip made me feel that we don’t realize just how much animals care for us,’ she said. ‘I realized that whatever I did as a volunteer, I was helping make a change...’"
"C’est plus que des vacances"
"Cet été, l’adolescente a refusé de partir en Grèce. Elle boucle sa valise pour une destination beaucoup plus exotique…'J’avais envie d’être constructive et de pouvoir aider, d’apporter quelque chose en fait.' Pendant un mois, Chloé va vivre au cœur de la jungle amazonienne dans une réserve d’animaux. Au milieu des perroquets et des singes, des vacances utiles, dont cette passionnée d’écologie rêvait depuis longtemps." "Work abroad gives career flexibility, cultural savvy"
"If you didn't study abroad in college, you may not have missed your chance. In fact, more and more people are choosing to delay the abroad experience until after they finish college, or are even a few years out of school, says Tom Pastorius, vice president of Projects Abroad, an organization that hosts volunteer projects in Africa, Asia, Eastern Europe and Latin America." "The Lost Girls: 10 Life-Changing Getaways"
"Since I first set foot on a soccer field at the age of 5, I fell head over cleats in love with the sport. While I stopped playing competitively years ago, I still indulge in the occasional street 'match' with local kids overseas, who get quite a kick out of playing with an American woman. For fellow travellers who want to lend their soccer skills to children in need, Projects Abroad offers a multi-week volunteer coaching program just outside of Rio de Janeiro -- with limited or no experience necessary." "With Projects Abroad, High School Students Make a Difference and Take Joy in Doing It"
"Wherever the student volunteers, they will be making a lasting impression on all the children they encounter. For volunteer Liam Goulding, it was just the opposite. 'Whilst in Ghana it was also my birthday and the children at Abura Literacy School all made me birthday cards and during the monthly party in Accra, which all volunteers currently in Ghana can attend, they all sang and wished me a happy birthday. It was certainly a birthday that I won’t forget!'" "See the World, Helping Animals"
"Because care for animals in undeveloped places is not easily available or affordable, the Projects Abroad folks offer placement for just about anyone, from students to retirees and everyone in between, to give back and lend a much-needed hand. There are more than 100 different projects, and internships in Veterinary Medicine and Animal care are available, no matter what your level of expertise is, or isn't"
"An Overview of Volunteering with Humanitarian Organisations"
"Two student nurses who recently used their university holidays to volunteer with Projects Abroad generously shared their experiences with me...Lucy feels that, ‘the nursing experience was invaluable and something every first world medical professional should experience. It made me realise how lucky we are and the vast amount of resources we have." 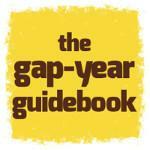 "The gap year goes professional"
"More gappers than ever are aiming to spend time constructively to boost their careers. The gap year is going professional. If that sounds dull, think again. With a bit of imagination and planning you can organise a gap year that is both memorable AND a valuable first step on the career ladder. Here's how..."
"Not Your Average Summer Vacation: How These College Students Made a Difference This Summer"
"Jessye Kass, a junior from Brandeis, has always been fascinated with Africa. She currently has a double major in anthropology and African and Afro-American studies. In 2009, she visited Africa for the first time through Projects Abroad, a program that organizes students interested in volunteering in another country." "Projects Abroad Donates To Toase Hospital"
"Projects Abroad Ghana, a Non-Governmental Organization (NGO) has donated assorted hospital equipment worth GHc1000 to the Nkawie-Toase Government Hospital in the Atwima Nwabiagya District of the Ashanti region. The items which were presented last Tuesday included two delivery sets, 20 mosquito nets, eight artery forceps and five bicycle covers." "Learn a Language While You Volunteer"
"Discover Inca Secrets in Peru"
"Medical student from Owasco gains valuable field experience in Ghana"
"Launch Your Reinvention with Travel Abroad"
"Projects Abroad Pro: Why go? Use your skills to strengthen an overseas developing community through voluntary work. Volunteering turns your focus from yourself to others—giving you perspective. Because your attitude matters; it can help or hinder you." "Searching for a New BFF? Take a Summer Course"
"Projects Abroad is a short-term international volunteer program with projects in 26 countries. This summer, the organization is offering 14-, 30-, and 60-hour "Language Plus" courses for those who want to learn a new language or practice skills that have gotten rusty. The courses are run in association with international volunteer programs, and are tailored to each individual's language skills." "Student makes a difference through African trip"
"Harriet Walker, 19, decided to go to Ghana after she finished her studies at Christleton High School, Village Road, Christleton, last year. She spent much of her time in Central Regional Hospital, Cape Coast, near Bura, in Ghana, and took part in a range of activities including visiting a leprosy camp and organising games for local children…’The placement was challenging, my host family were friendly and supportive and the country is beautiful, if not slightly crazy. It was a once-in-a-lifetime experience and I loved every moment of it." "Thaïlande : le grand voyage d’Elisa"
"Elisa ou : comment à dix huit ans décider de prendre une année sabbatique et partir à l'étranger se faire une expérience personnelle. Pour découvrir un tout nouveau monde, Elisa choisit de participer à une mission d'écovolontariat…Direction la Thaïlande et le parc national de Ko Phi Phi au sud-est de Pucket." "[“At 18 years old Elisa decided to take a gap year and travel abroad to live-out a true personal experience. 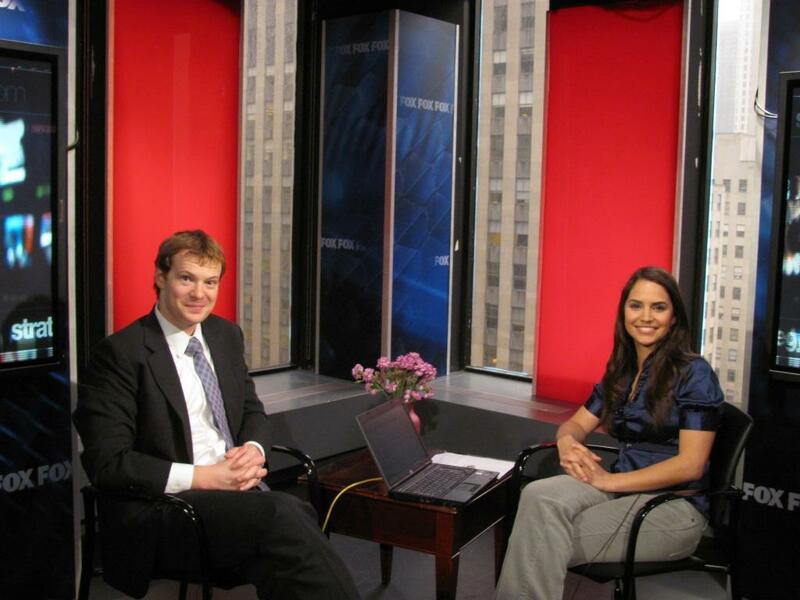 To discover a whole new world, Elisa choose to do a Conservation project...heading to Thailand and the Ko Phi Phi national park, south-east of Phuket.”]"
"New York Nightly News with Chuck Scarborough"
Projects Abroad Vice President Tom Pastorius speaks about the Global Gap program on New York Nightly News with Chuck Scarborough. "Join the Celebration in Machu Picchu, Peru"
"It's not too late to explore the ruins of Machu Picchu during the 100th anniversary of the date when Hiram Bingham discovered these spectacular ruins of the Inca civilization high in the mountains of Peru, then broadcasted the news around the world…Projects Abroad has an Inca project, which includes living with a local family or working alongside archeologists." "From free man to slave: walking through the ‘door of no return’"
"Projects Abroad volunteer Claire Chaffey writes about her trip to a slave castle in Ghana." "Is volunteering still on your agenda?" "Given the challenging economic environment that UK companies are operating within, the fact that many companies continue to allow employees to devote time to volunteering projects, often overseas, appears to be something of a surprise…Ian Birbeck, a director at Projects Abroad, a company that sends teams and individuals across the world to assist in community projects ranging from home-building to teaching, explains: ‘I think in terms of retention it's important. We see loads of people in their early thirties who go on career breaks because they need a break. Of course the company loses all of that skill if they go away and come back to work for a competitor. But if they fund a month away from the office, they'll come back refreshed and ready for the next 10 years." "Emission 50 ans qui ont changé notre quotidien"
"Pour ses vacances, Nicole fait un choix différent. En 2009, elle part en Thaïlande, comme beaucoup d’autres vacanciers, elle vient y faire de la plongée dans des fonds marins exceptionnels.…Quand Nicole ne plonge pas pour ramasser des déchets, c’est pour répertorier la faune et repérer les espèces menacées. Elle tient à faire de ses vacances quelque chose d’utile. 'J’ai l’impression que je dois bien ça à la nature, une manière de lui renvoyer toutes les joies que la nature peut apporter.'" [“For her holidays, Nicole chose something different. In 2009, she left for Thailand, and like many others, she left to dive in the exceptional waters of Thailand…When Nicole doesn’t dive to collect waste, it is to collect data on the fauna and identify endangered species. She wanted to do something useful during her holidays: 'I feel like I owe it to nature, it’s a way to give back for all the joys that nature can bring. '”]"
"9 Travel Experiences to Get You Inspired and Energized"
"Ready to give back? Here is the perfect opportunity to give of your time and energy. You'll work outside Sri Lanka's capital, Colombo, with schools located in small towns along the western coast. Projects Abroad can place you in a coastal village school or at a school in the hills for the children of tea planters. Some of the schools are close to the beach; some are even based in temples." "When Kathleen O'Neal packed her bags for a six-week trip to Ethiopia, it was the realization of a dream deferred. In the 1960s after she graduated from college, O'Neal had been invited to be a Peace Corps volunteer in that country. But then her mother got sick; she met the man she would marry, and O'Neal never made it to Africa. So two years ago, at age 65, O'Neal signed up for a Projects Abroad mission to Addis Ababa, Ethiopia." "그 오지로 36살 처녀 선생님 송영화씨가 ‘프로젝트 어브로드’를 통해 겁도 없이 들어갔다. 그녀의 직업은 소아과 의사, 일에 있어서는 그 어느 여성보다도 파격적이고 도전적이지만 인정 넘치는 의사선생님." Projects Abroad South Africa’s Alyssa Myers is interviewed on SABC 3's Expresso. "Projects Abroad’s Volunteer Opportunities for Students"
"Instead of choosing to spend their summers lifeguarding or in an unfulfilling office internship, students are opting to spend their summers making a difference in the global community by volunteering abroad. Projects Abroad, a leading international volunteer placement organization, offers a wide variety of summer internship opportunities and special two-week high school programs in developing countries around the world." "The sense of peace of having a good roof over one's head is something that every individual dreams of in life. This helps to understand the joy felt by 77-year-old widow Cassinia Smith, as she witnessed the work done by volunteers on her two-bedroom house in Clarkes Town, Manchester, on Friday." "This week we wanted to highlight one of our favorite Voluntourism companies, Projects Abroad. Pioneering conservation and research activities are at the forefront of protecting and researching diverse marine environments and Project Abroad doesn’t just stop at the well known diving locales, but also at the smaller lesser known beaches… like those in Cambodia"
"Vous avez Project Abroad, qui organise des stages en Afrique, en Asie, en Amérique du Sud et au Canada. Pour la réinsertion de certaines espèces animalières ou simplement pour les soigner. Une sorte de volontariat animalier sur des terres qui ne sont plus propices aux activités du rhinocéros ou du colibri." "Skip the Diploma: Alternatives to College"
"As an alternative to school, one way to get life experience and travel the world is by volunteering for an overseas or domestic organization. Getting a more global view of life can help students gain perspective about what they want to do. 'By going abroad, you get the opportunity to step outside the insular world that you grew up in and put it in a greater context,' says Tom Pastorius, vice president of Projects Abroad." "PIC Fellowship: The Life Changing Experience in Cape Town, South Africa"
"I arrived at the Projects Abroad Human Rights Office in the southern suburbs of Cape Town in late May. I was welcomed by staff and interns from all over the world, including Holland, Senegal, England, Angola, France, Japan, and Cameroon. My supervisor, Theodore Kamwimbi, was a lawyer originally from the Democratic Republic of Congo...I will always remember sitting in his office one day as Theo gave me the best piece of advice I received all summer: 'Emily, if you don't cry for these people, then you aren't human. If you aren't human, then you aren't cut out for human rights work.'" "We sat down Ian Birbeck, Recruitment Director at Projects Abroad, and Scott Macquarrie, Director at Projects Abroad PRO, for a chat. Projects Abroad is a volunteer-sending organisation, and PRO is its sister company which recruits volunteers with professional skills. We wanted to know what it's really like working for a volunteer organisation, and what myths they would dispel. Some of what they say may surprise you." "'It's a great experience. The kids have so much energy,' he said with a laugh. Treleaven is one of hundreds of overseas volunteers who have travelled to Jamaica to serve worthy causes and experience Jamaican culture since 2008, thanks to Projects Abroad." "Year off before college can offer new perspectives"
"This is the time of year that many high school seniors are anxiously awaiting letters of acceptance, or rejection, from colleges and universities. But a small percentage will take a different path to higher education." "Projects Abroad provides support to fleeing refugees"
"Since the fighting resumed in the Ivory Coast last month and political tension continues to grow, Projects Abroad, the international volunteering company is announcing that it is providing care to over 2000 registered refugees that have fled to the Western region of Ghana." "Increasingly, as spring break approaches, the term “Alternative” is seen lumped in with those words. What does this mean? It means that a week that once was responsible for the death of billions of brain cells is now a time devoted to bettering humankind, specifically by college students; but the idea has caught on throughout every age bracket." "Vinalhaven senior spends spring break in Ghana"
"Travel anywhere, but particularly to a foreign country, is bound to be eye-opening. For Martin, visiting Ghana 'made me realize how materialistic the U.S. really is,' she said. 'The kids over there were always happy. For kids that don't have much, you would have never realized by their little giggles and soft touches. You could give them something as simple as a new coloring book or a pack of crayons and they'd be happy for hours.'" "Help Kids on These Other Trips Worth Taking"
"Near the town of Wadduwa, on Sri Lanka's southwestern coast, Projects Abroad has set up a computer centre. The program offers free, three-month courses in information technology to children in the community." "Eric and I had never volunteered outside of North America but I always had a dream about volunteering in Africa. Several agencies offered volunteer trips, but Projects Abroad answered all our questions and was really helpful. I called repeatedly because I had so many questions. Their 24-hour on-site staff and the global awareness of the organization made us feel safe and secure.'" "SPASH grad to help doctor in Ghana"
"'I knew that I wanted to take this as an opportunity to give back to a cause that I really didn't have much exposure to in the Midwest,' Mitchell said. 'I've been so far removed from this worldly issue that I think I need to educate myself as a global citizen, and I felt that now is the perfect time to do that.'" "Discover the world during spring break and give back"
"Some college students have opted to study abroad while in college. Volunteering abroad takes that cultural experience to a completely different level. Opting to do it during spring break adds an even broader scope to the benefits: you utilize that week to enhance the lives of others. Volunteer, live with a host family, and sneak in the sights, all in a week. Instead of the typical spring break souvenirs, you will come home with unforgettable life-changing experiences and memories that last a lifetime." "Travelling to exciting and far-flung destinations is certainly an enriching and unforgettable experience, but I wanted to take away something that would help me in the future. For this reason, I decided to take a French language course in Morocco with Projects Abroad...It's a unique opportunity to be thrown together with people from all over the world who all want to experience this modern yet traditional culture firsthand." "One of the best decisions I ever made was to take a year off from my otherwise full-speed-ahead education to live in rural Thailand for a year...Gap years - a year between high school and college - are becoming increasingly popular among American teenagers." "College students who want to see their time used for good might consider Projects Abroad's weeklong 'Alternative Spring Break Trips.' The excursion to Jamaica involves rebuilding impoverished sectors of Manchester Parish, where many have lost their homes to hurricanes. No construction experience is required, and volunteers stay with host families. The experience ends with an excursion to a beach or waterfall." "U alumni wins trip to Ghana, Africa"
“'I thought the trip was a perfect chance to broaden my horizons to travel to a continent and a country I’ve never been to,' Mitchell said. 'I know I wanted to challenge myself.' Mitchell will work in conjunction with the government’s hospital in Accra, the capital. The project is designed to care for people who are infected or affected by HIV and AIDS with counseling, helping doctors test for the virus, campaigning for proper nutrition and awareness, and prevention outreach." "Would you do voluntary work on your honeymoon?" "'Honeyteering' is where just-married couples volunteer for a worthy cause in the developing world, rather than the indulgent two weeks on a beach. A growing trend in the United States, it is relatively new in the UK...It has already become commonplace for the bride and groom to ask guests to donate to a charity rather than give presents. The logical extension is for the happy couple to give up their time on honeymoon helping a worthy cause, says Dr Peter Slowe, founder of volunteering firm Projects Abroad." "Volunteer Abroad for Spring Break 2011 With 'Projects Abroad'"
"Volunteering abroad is a fantastic, life-altering experience: the travel, the opportunity to help someone else, the new knowledge about you and your place in the world are invaluable results. Volunteering abroad is a big commitment, though, and the planning and research can seem daunting. Here's a solution: try it out by volunteering abroad for spring break. One week. No big commitment. Perfect." "For the adventurous couple, take advantage of your honeymoon to bond with each other and do something great in the world. With Projects Abroad, choose from over 100 projects in 26 countries to get a truly gratifying honeymoon experience"
"Instead of spending their honeymoon lounging on the beach or being cooped up in a stuffy hotel room, newlyweds can now celebrate by giving back! A 'Honeyteer,' a honeymoon spent volunteering, is the perfect way to start a new life with your spouse or partner. Projects Abroad offers over 100 projects in 26 countries worldwide and can give newlyweds a unique and gratifying honeymoon experience." "Tourisme solidaire: aller plus loin"
“L'Afrique. Bien des gens rêvent d'y aller, mais ne savent pas comment l'apprivoiser. Surtout si ce sont les rencontres authentiques qui les atirent plutôt que les safaris organisés. Quand j'ai décidé de faire un voyage «solidaire», j'ai tout de suite pensé que c'était le meilleur moyen de découvrir enfin l'Afrique. Quelques clics plus tard, j'ai atterri sur le site d'un des nombreux organismes et agences de voyages solidaires, Projects Abroad, qui a un bureau au Canada et qui gère des projets dans 26 pays. "Interview with Projects Abroad Volunteer Katie Grott"
"Instead of doing something on your own, you have the support of Projects Abroad. I felt safe from the minute I boarded the plane to the minute I returned to America. While in Romania, I talked to people who actually lived in Brasov and could tell me where to go and what to see. My time there, though brief, was really well utilized. I gained a real sense of the culture, because I became a part of it instead of just vacationing in it." "With its brutal history of apartheid and colonialism, there can be few better places than South Africa to get involved in campaigning for human rights. Projects Abroad has short-term placements in Cape Town which give volunteers the opportunity to work alongside respected humanitarian organisations, while gaining first-hand experience of human rights law in practice." "Gap year experience 'important as degree to employers'"
"More than half of all business managers view job applicants' gap year experience as being equally important or more valuable than a university degree, according to new research...In fact, some of the managers said they consider experience of volunteering, studying or working abroad to be more crucial than a degree when looking for potential interview candidates." "Aussies celebrate Australia Day in Ghana"
"Speaking on behalf of the Ghanaian government, Minister for Education Betty Mould-Iddrisu, expressed her country’s gratitude for the support provided by Australia. 'Ghana appreciates the significant contributions that Australia has made to the country’s socio-economic development in recent years,' she said...According to Daniel Thompson, Assistant Regional Coordinator of UK-based company Projects Abroad, they typically have 20 Australian volunteers undertaking placements in human rights, journalism, care, health and sport throughout Ghana." "Retirement-age volunteers mix altruism with travel"
"Patti Cooper-Smith, 64, of Carson City, Nev., wanted to go somewhere for a month to both improve her Spanish and contribute something. So she went to Urubamba, Peru, last year and taught English through a Projects Abroad program...'It was much more enriching and a little more altruistic than me just paying someone to teach me," she says. "You can't accomplish much in a month, but I did feel that I was contributing.'" "Volunteering abroad: why college is the perfect time"
"While internships have their merit, and earning money is necessary for the collegiate lifestyle, the value from taking a few months to volunteer is limitless. Additionally, future employers or graduate school admissions boards will respect the decision you made to volunteer abroad. Most important, many communities both domestic and international have a very strong need for the support from even the commitment of just a few weeks." "Though college and university students are now starting a new semester, it doesn't preclude them from brainstorming spring break ideas...Another increasingly popular spring break idea is embarking on a spring break volunteer trip. Discover a new part of the world while helping people in need! Groups like United Planet and Projects Abroad make it easy, offering a wide variety of packages for spring breakers looking to participate in projects around the world." "Q&A with Projects Abroad Founder Peter Slowe"
"Volunteering in a developing country and staying with a host family fully immerses volunteers in that country’s culture, allowing them to gain a deep, worldly perspective. This is something that can’t be achieved simply by travelling abroad. By working alongside locals, teaching students, or caring for underprivileged children, volunteers can vastly expand their global point of view and see the world in a more educated light." "Cambodia no cruise for Tara"
"Tara Morrison is packing insect repellent and sunscreen this summer – but not for a trip to the beach. Instead, Ms Morrison is travelling to Cambodia to volunteer her services as an occupational therapist. The 22-year-old has just finished her honours thesis while working at Taranaki Base Hospital, and is ready for a new challenge. The trip to Cambodia became a reality when she got in touch with Projects Abroad, a volunteering organisation." "Volunteering for a very different Christmas"
"I chose to go away with Projects Abroad because it is the largest (and probably best) organiser of overseas volunteering and the staff really does its best to match volunteers’ skills to the needs of the partner organisations abroad. My sister volunteered in Ghana and she highly recommended the whole experience with Projects Abroad." "Best Places for a Sabbatical"
"Budding archaeologists can help unearth mysteries in the ancient city of Dacia (now Deva), located in the medieval environs of Transylvania—the place where the brutal ruler Vlad the Impaler first inspired the Dracula legend. Through this multiweek program with Projects Abroad, you can work with Romania’s Museum of History to conduct digs and restore ruins across several sites." "Tis the Season for Giving"
"Instead of donating the contents of your wallet, why not donate your time! Projects Abroad provides spring breakers the opportunity to ditch the resorts for more genuine feel-good alternatives such as home building or sea turtle conservation." "Green travel: top eco getaways"
"For the passionate eco-warrior, there are an increasing number of opportunities for voluntary conservation work...Wherever you want to go and whatever you want to do, there’ll be a green option. We can all make a difference by selecting holidays that don’t just save us money, but which save the planet. It’s what all the cool kids are doing these days." "If you're not into the traditional, all-inclusive honeymoon package, perhaps you and your new spouse might consider a "honeyteer," a volunteer-based honeymoon. You might travel across the world to teach English, or head to a tropical island and help out with beach cleanup. The possibilities are endless, and you can design your "honeyteer" around volunteer activities you both love." "Tulsa teen travels to India to help farmers"
"Far away, in India, 18-year-old Piper Connelly composed an e-mail to explain how exactly she found herself in the village of Ullar - a place where a few hundred people live near rice and sugarcane fields while the mountainous Western Ghats stretch in the distance." “'I chose Projects Abroad because they help with details like food and flights,' Ruark said, 'but also give you a lot of independence.'... Ruark is grateful for the experience. She is amazed at the differences in culture between Ghana and America, and she learned a lot about cultural sensitivity, returning with admiration and respect for Ghana’s people." "Lumos Travel Award Winner Selden Recounts Ghana Experience"
"May 2010 Belmont graduate Abby Selden returned to campus recently to offer a presentation on her experiences in Ghana. Selden is the first recipient of a Lumos Student Travel Award, which is a grant given annually to help students embark on a travel experience that will give them a different cultural perspective of some aspect of the social sciences: visual, performing and/or linguistic arts; or to enhance an artistic, scientific or teaching skill or talent." "Voluntourism, The New Travel Trend"
"Projects Abroad specializes in arranging accommodations and work projects for people who want to become part of the community they are helping...'Part of what makes the experience with Projects Abroad so special is that our volunteers are welcomed into the home of a host family, providing a complete sense of community and immersion into the local customs.'" "Accueillante, solidaire, généreuse : l’autre visage de la France"
"Complément d’enquête sur ces Français qui prônent d’autres valeurs: l’accueil, la solidarité, la fraternité, l’universalisme...Qui sont ces citoyens qui se dévouent pour aider ? Quels risques sont-ils prêts à prendre au nom de la générosité? Les bons sentiments suffisent-ils quand les moyens manquent." "Sri Lanka: The first days of my 'gap semester'"
"The plane ride: twenty-two hours. A whole day of barely resting because the hum of the engine and the mild discomfort of sitting upright prevented me from sleeping more than three hours. It was almost like a dream...It was bizarre to think that in a day, I would be somewhere completely different— an alternate universe so to speak." "Close to three hundred voluntourists have visited Fiji since April last year and according to a leading agency, more are scheduled to come. Projects Abroad, one of the world's leading voluntourist agencies, said the number of people showing interest in visiting the country was increasing." "If you’re a musician or music lover, consider travelling to Jamaica to teach a child how to play an instrument. As a volunteer with Projects Abroad, a Britain-based program, you will teach children ages 6 to 18 how to play keyboard, guitar, violin, flute, or drums. Or you can offer instruction on melody improvisation, and how to read, notate, compose, and arrange music. The Music Project focuses on traditional Jamaican music but incorporates cultural influences from around the world. Projects Abroad provides all instruments and resources." "In an effort to take her mind off the life-altering news, she went to Mexico last summer with Projects Abroad, a volunteering organization. 'I wanted to do something that’s not related to sports, not related to school, not related to anything or anyone,' Nightengale says. Nightengale worked with a wildlife conservation project to ensure baby sea turtles survived until hatching...For a month, Nightengale dedicated her days and nights to the protection of sea turtles, finally watching as the baby turtles hatched and dug their way from the sand and eventually to the ocean." "The number of Americans taking gap years through Projects Abroad, a U.K. company that coordinates volunteer program around the world, has nearly quadrupled since 2005. The organization just launched Global Gap, its first effort marketed specifically to Americans; the 27-week curriculum features service projects in South Africa, Peru, India and Thailand." "Ask Trip Coach: Volunteer Vacations"
"Stay with a local host family. Mine lived in South Africa and endured apartheid. We had some incredible talks that made my experience so much better.' —Emily Dennis, 24, of Nashville, Tenn., who volunteered at a human rights firm in South Africa in 2009 with Projects Abroad"
"I am the last business traveller who actually loves flying and airports. I always try and take a slightly different route when I go places, and I even plan all my trips in great detail. I’ve really learned to keep everything in perspective relative to travel. I must because I’ve had so many bizarre and sometimes wonderful experiences." "Trips and Tips for Fall and Beyond"
"Forget trick-or-treating if you’re volunteering in Peru over Halloween; you’ll be playing a traditional game involving not-so-hard-boiled eggs instead. Your Christmas in Fiji will be “bright” not “white” and Christmas in Ethiopia, celebrated in January, might entail the sharing of a dish of ox stew. If you’d like to volunteer overseas and can take at least two weeks off from your studies, find a list of opportunities at projects-abroad.org." "Whether you're a student looking for a dynamic Eastern European internship or a working professional in need of a breath of fresh air, Projects Abroad has opportunities to help you advance your career…Professionals in business development, culture and media, education, engineering, environment, human rights, medical and social work fields acquire unpaid projects that may lead to overseas career placements." "Destination of the week: Phnom Penh, Cambodia"
Cambodia can be a hard place to relax. Walk the streets of Phnom Penh, its capital, and you’ll see beggars whose signs say they were victimized by the Khmer Rouge, a brutal Communist regime that according to the New York Times killed or caused the death of 1.7 million people between 1975 and 1979. Barefoot children ask for money in cafés. Wander the city’s darker side streets and you’ll feel mildly sketched out. "Explore Ethiopia for its ancient culture"
"I went to Ethiopia in May for a month as a volunteer with Projects Abroad for my senior class project at the Haverford School. I worked as a journalist in the capital city of Addis Ababa, writing articles about Ethiopian culture for a local newspaper. I tried to absorb as much of the culture as I could, touring Addis Ababa as well as many historic small towns such as Lalibela, named after the king who built the city about 1,000 years ago." "GHS graduate takes his skills to South Africa"
"'The most rewarding thing about this trip was gaining a completely new perspective on both life here back home and also in South Africa (my other home). I noticed that we take so much for granted here. It's shocking how excessive the American lifestyle can be without us realizing it.'" "On the Job Hunt: Volunteer Overseas"
Projects Abroad’s Vice President Tom Pastorius appears on FoxNews.com’s Strategy Room. "Globe-trotting: Take a volunteer vacation in Tanzania"
"Wendy Tisdell, a director at BridgIT, guided the [Water and Sanitation] program in Jamaica last year and is doing likewise in Tanzania this summer. She is a former Projects Abroad volunteer whose experience inspired her to use her professional skills and give communities around the world a chance to access clean water"
"Where he hoes I’ll go"
"The couple met a counsellor at the Projects Abroad Human Rights office on Thursday to start reconstructing their life. The meeting was as much about designing a plan for the couple's immediate future as it was a chance for them to vent… The counsellor laboured through Philippe's long-winded rants to motivate the couple to ‘take life into your own hands and don't wait for the government’." "Turn Tots And Teens Into Voluntourists"
"Because the projects are so varied, families who want to find the right volunteer match should have a 'long and serious discussion with us about what you hope to get out of the experience,' says Dr. Peter Slowe, Projects Abroad’s founder and director." "Après les journalistes Sylvie Saint-Jacques et Éric Clément, c’est au tour d’Émilie Côté de déposer ses valises aux quatre coins du monde. Émilie est une Montréalaise qui ne déménagerait nulle part ailleurs au monde, mais qui adore voyager. Jusqu'à la fin juin, vous pouvez la suivre de l'Asie en Europe en passant par l'Afrique." "Volunteer tourism in Peru is one of the most rewarding ways to see different parts of the country while doing some good at the same time...Not only is volunteer tourism relatively inexpensive in Peru, it also makes much needed contributions toward protecting the environment and assisting Peruvian citizens living in poverty." "Hurricanes Dean and Gustav tore through the Caribbean island of Jamaica in 2007 and 2008, leaving many houses water-damaged or completely destroyed. Volunteer organization Projects Abroad, together with the Adventist Development and Relief Agency, is dedicated to rebuilding more than 40 homes in the parish of Saint Ann, on the island's northern coast." "'The biggest benefit is, first of all, to develop a sense of adventure and certainly a sense of confidence, as well as being able to manage in a lot of different situations,' she said. 'You become very adaptable and learn to survive with less, and I think you learn to accept people for how they are and not judge them." "Mullingar women matching volunteers with international opportunities"
"The fact that young people, who haven't yet got skills or qualifications in place are still welcome to travel out, and help in whatever way they can, means Projects Abroad is different to some other organisations that arrange placements." "Haiti quake sparks interest in 'voluntourism"
"When the going gets tough, the compassionate get going. The January earthquake in Haiti prompted a spike in interest in service vacations, sometimes called "voluntourism," several organizations report...Projects-Abroad.org reported it received 46 percent more applications than expected since the earthquake." "The massive earthquakes in Haiti and Chile have sparked an increase in service vacations – also know as voluntourism...Projects-Abroad.org – which sends students and professionals on short-term service projects – says, since the quake, it’s received almost twice as many applications from prospective volunteers." "Summer vacation! Unless you’re at a year-round school, it might mean a little sun and sand, maybe a part-time gig at the public links, or more time with your own kids. But just because school is over doesn’t mean the learning has to stop for you...Through agencies like Projects Abroad, you can set off on 'meaningful travel'"
"Learning sustainability from the rainforest"
"Kennedy lived a few hours outside of Puerto Maldonado, a city in Southeastern Peru, shacking up in a bungalow made of wood and mosquito netting...It didn’t take him long to get accustomed to the Amazonian lifestyle. 'I felt at home within a few days,' he says. 'We don’t necessarily need all the stuff that we have.'" "I’d always wanted to do something like this,” he says. “My group was building a childcare centre for parents who couldn’t afford childminding, while many other volunteers were teaching.” Brian travelled with Projects Abroad, an international organisation that arranges volunteer work for school and university students and professionals." "Teen goes overseas for volunteer work"
"Research led her instead to Projects Abroad, an organization that links volunteers with work and destinations according to their interests. As its website explains, Projects Abroad “sends over 6,000 high schoolers, university students and professionals on short-term international service projects each year." "A volunteer-minded traveller leaves a bit of his heart behind"
"That's what prompted me to enter the world of the volunteer tourist. After searching the Internet for weeks, I felt as though I had found the ideal environment to create lasting change working through www.projects-abroad.com. I spent a month working in a local school trying to foster learning and cross-cultural enlightenment. Leading English classes for 30 Peruvian children was a baptism by fire. But it was inspiring to nurture them, if only for a short time." ""I’m speaking with a couple of different organisations at the moment – Projects Abroad, Love Football and the school where I teach – about how we could provide long-term support. Everyone’s support so far has been amazing but there’s more work to do if we’re to truly help this community”." "Explore like a star and do a world of good"
"Follow in the footsteps of Angelina Jolie -- and make a difference -- by taking a volunteer vacation with Projects Abroad, which sends 6,000 people a year to 25 fascinating countries." "Countryside High graduate is in Ghana to help human rights victims"
"The 19-year-old University of Miami student and 2007 Countryside High graduate is interning this summer for the Projects Abroad Human Rights Office in Accra, which is concerned with female genital mutilation and the environmental impact of mining among other issues." "Area teen launches book drive"
"Jillian organized and planned her trip to Arusha, Tanzania, with Projects Abroad, a volunteer organization she felt safe with. Although her parents, Marty and Diane Froelick, offered to pay for half the trip, Jillian wanted to raise the money through friends and family and getting a part-time job." "Projects Abroad Australia is one of several commercial organisations offering a smorgsabord of volunteering opportunities..."
"Parents concerned about students' gap-year safety"
"Peter Slowe, the founder of Projects Abroad, a gap-year company, said that the first Gap Year Safety Conference, which is being held in London on June 17, had in part been called as a response to heightened parental concern and the number of gap-year tragedies. 'Safety is top of parents’ priorities,' Dr Slowe said. 'We have had lots more contact with parents and the consciousness about safety is higher than some years ago.'" "How to stay safe on a gap year"
"Peter Slowe, founder of Projects Abroad: 'My advice: always travel in a group (especially if you’re a younger gapper), always check your insurance (expensive insurance does not necessarily mean better insurance), and always make sure you do some research before you go – such as whether you need a mosquito net, what medicines you might need or the appropriate dress code for the country you’re visiting.'" "Leading from the Front Line"
"David....decided to use funds set aside under the program to travel to South Africa for a month-long stint as a volunteer with Projects Abroad -- an organisation that runs benevolent projects overseas." "Do something useful with your time"
"Surely volunteering is mainly a student gig? 'Actually, women taking career breaks, perhaps due to redundancy, are the fastest growing group of volunteers. And it doesn't just appeal to philanthropists, but women wanting to improve their skills or to see the world in a safe environment.'" "Recession helps boost guilt-free tourism industry"
"Projects Abroad, which runs volunteer programs overseas, said bookings were up 20 percent this February from February last year, with some of the travellers recently laid off, but others simply looking for vacations that involve service. Options range from teaching soccer in Moldova for two weeks to teaching English in Nepal for three months." "The family chose the Projects Abroad: Teaching program and Casper is set to leave on July 15 for about five weeks. She will teach English to primary and secondary school students. 'There's also the opportunity to teach students other interests you have, like sports or music or drama,' said Casper..."
"...associations like...Projects Abroad are thriving. The projects are wide-ranging and usually run year-round...Volunteers don't need any special skills other than an open mind and an adaptable spirit." "Getaways That Are 'Guilt Free'"
"Projects Abroad, which runs volunteer programs overseas, said bookings were up 20 percent this February from February 2008, with some of the travellers recently laid off but others simply looking for vacations that involve service." "Small Business Directors and Entrepreneurs Flee U.S. on 'Enterprise Gap Years"
"More than half of the 60% increase in older volunteers leaving on gap-years in developing countries are American small business directors and entrepreneurs, according to Projects Abroad, the world’s leading commercial volunteer service organization." "travelling alone was a challenge - but got me a job back home!" "I found out about Projects Abroad, who offer volunteering placements in rehabilition centres, on the internet and thought they sounded perfect. I could spend three months in South American while getting some overseas experience in occupational therapy...We were reassured when I was told I'd be met at the airport and given accommodation in a safe place." "Time for a CV Change"
"Projects Abroad, the largest commercial volunteer service organisation in the world with schemes in 24 countires, has experienced a big increase in the number of people wanting to give their time gratis." "UK-Based Voluntary Group Paints Classroom and Donates Books to Manchester School"
"...Bridgette Barrett, Country Director for Projects Abroad, said that the group conducts a "dirty day" every month, to give a facelift to a school or hospital. It's a physical activity. We are getting dirty, but at the end, we accomplish a task. We chose Villa Road as it has been with us since 2008, so that this classroom will be fully painted and reading materials given to the students," she informed." "As unemployment rate increases, more individuals choose to spend time volunteering"
"...n recent months, organizations like Projects Abroad and Peace Corps have seen record increases in people’s willingness to volunteer. 'People are finding themselves out of jobs and are using it as an opportunity to get something done that they’ve wanted to do for a while, but might not have been able to because of the time constraints of their job." "Some U.S. jobless find hope and solace as volunteers"
"Applications to Projects Abroad, a private organisation that directs thousands of volunteers to developing countries, jumped 55 percent in December and nearly 50 percent in January compared to a year earlier. Volunteers must pay their own way." "Projects Abroad...The group's founder, Peter Slowe, said a growing proportion of new applicants are middle-aged people who find themselves unemployed or underemployed and have long thought about testing their abilities, or are just fed up." "Applications to Projects Abroad, a private organization that directs thousands of volunteers to developing countries, jumped 55 percent in December and nearly 50 percent in January compared to a year earlier." "Failing economy gives rise to volunteers"
"...Projects Abroad reported an increase in applications of 64 percent in 2008...those who are interested in volunteerism will note a definite perk to the idea: a competitive advantage on job searches in the future." "Applications to Projects Abroad, a private organization that directs thousands of volunteers to developing countries, jumped...Volunteering can fill a gap in job history and supplies the answer to an interviewer's question, "what have you been doing?" "U.S. Unemployed Find Purpose in Volunteerism"
"Applications to Projects Abroad, a private organization that directs thousands of volunteers to developing countries, jumped 55 percent in December..."
"Some US jobless find hope and solace as volunteers"
"The World's Best Working Holidays"
"The neem tree is a godsend to Indian farmers, but few of them are aware of it, so your job is to spend at least a fortnight in Tamil Nadu marketing its miraculous properties... The trip is available year-round... with Projects Abroad." 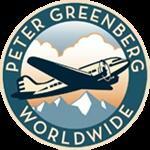 "Dr. Peter Slowe speaks about Projects Abroad." "Uni can wait, but the poor of Africa cannot"
"THIS time last year I was completely confused about what to do with my life. After a successful year 12, I could study almost anything I wanted; problem was, I didn't know what I wanted... So I decided to spend a gap year overseas before starting university... I organised my trip with a volunteer group called Projects Abroad, which was wonderful. There were advantages and disadvantages... Projects Abroad was expensive compared with some other organisations, but it provided incredible help in preparing me for the trip, as well as support in Ghana, such as when I fell ill. There was also the advantage of being able to travel any time of the year." "Old people volunteer due to crunch"
"The number of older people volunteering for overseas projects has shot up due to credit crunch redundancies, according to gap year firm Projects Abroad. The number of over-25s signing up to volunteer abroad was 60% higher last month than it was in January 2008, spokesman Ian Birbeck said." February 2009, The Globe & Mail, Canada "What I did on my layoff"
"Unemployed and unattached? Try volunteering overseas"
Volunteering abroad is looking more and more appealing to those stuck at home mourning the loss of their jobs because of the economic storms that continue to fuel job losses across the country... 'There definitely has been an increase in calls during the past few weeks [especially] from career breakers,' says Robert Levine, director of Projects Abroad Canada. 'My guess is we're going to see a huge influx of people who have been laid off applying in the next month or two." "An army of altruists: VSO boosted by record rise in recruits"
"Ian Birbeck, recruitment director at the global volunteering company Projects Abroad, said his organisation had introduced 1,000 extra placements this year: 'We sent about 4,000 volunteers last year, and this year we anticipate sending 5,000. We're getting a lot of calls from people who have been made redundant. We're working on developing more professional volunteering schemes so people can use their skills." "Jobless Britons opt to volunteer overseas"
"We have seen an increase in the number of people in their thirties applying", said Dr Peter Slowe, founder of the organisation. "We currently have people from all sorts of professions: welders, care workers, staff from local authority finance departments and construction workers." "Student founds charity for Senegalese children"
"During the summer of 2007 Checkley spent five weeks working in St. Louis with Projects Abroad, an international relief organization that places volunteers in countries where help is most needed." "Recession sends volunteer numbers soaring"
Projects Abroad, the biggest organiser worldwide of overseas volunteer work, has also seen a rise in inquiries in the last few weeks. "We are maintaining our normal level of student applications, but recently we've seen a noticeable increase in older people, or those with more skills and experience, getting in touch," says Dr Peter Slowe, Director of Projects Abroad." "Nursing major named inaugural David J. Beck Fellow"
"The fellowship will provide Mikel with a full academic scholarship for 2009 – including tuition, fees, books and on-campus room and board – along with up to $10,000 to pursue the summer project she proposed as part of her application. She plans to travel to Ghana where she will work as a nursing intern in a rural hospital and live with a host family for six weeks through Projects Abroad." 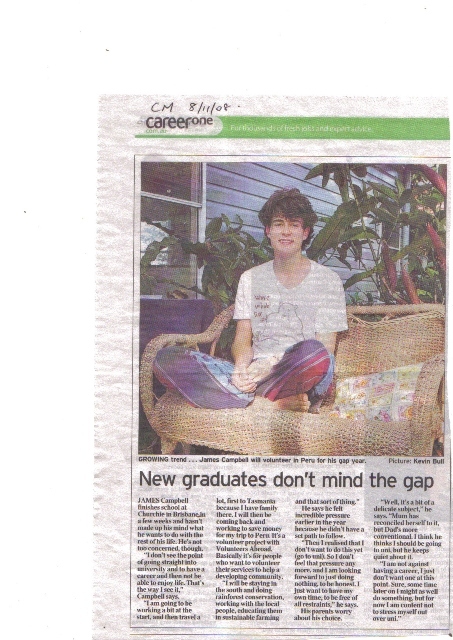 "New Graduates don't mind the Gap"
"James Campbell finishes school at Churchie in Brisbane in a few weeks and hasn't made up his mind what he wants to do with his life. He's not concerned, though... 'I am going to be working a bit at the start, and then travel a bit, first to Tasmania because I have family there. I will then be coming back and working to save money for my trip to Peru. It's a volunteer project with Volunteers Abroad [sic]. Basically it's for people who want to volunteer their services to help a developing community.'" "Great Humanitarian Trips Around the World"
"Nomad Community Outreach, Mongolia: Projects Abroad volunteers help nomad families with daily tasks like herding yaks and cattle, mucking out horse and camel enclosures, and milking sheep and goats. They also produce dairy products like butter and cheese, prepare meals, and play with the communities’ many children." Peter Slowe, Founder and Director of Projects Abroad, discusses bank capitalization and entrepreneurialism in the developing world. "The international organisation, Projects Abroad, registered a growing number of over 800 volunteers in 2008 who spent some free working months in Ghana, often combined with travelling around on the weekends. During their time they are either staying with a Ghanaian family..."
"How I made it: Peter Slowe, founder of Projects Abroad"
"As the number of youngsters signing up grew, Projects Abroad widened its scope to Africa, Asia and Latin America. Today its gap-year travellers help out in ever more diverse activities such as teaching in local schools, helping small enterprises with basic IT, assisting the RSPB with conservation projects and establishing a youth football academy in Ghana." "The 16-year-old, from Hermitage Park Way, Newhall, spent two weeks in the African country's capital, Accra, after raising £2,000 to fly out on July 19 with Projects Abroad, one of the world's leading organisers of volunteer placements overseas." "Louisburg Woman Explores Beyond the Great Wall"
"After doing 'a ton' of research in her quest to go to China, Fleming said she found a British company, Projects Abroad, that pairs young adults with others in countries to do volunteer work and internships, like teaching English and practicing medicine, law and business concepts." "Sikhisizwe - Building the Nation"
"Today we spoke to Dana Myers – from Project Abroad. We were talking about their Human Rights placements. This project gives volunteers the opportunity to work on a really worthwhile project alongside respected humanitarian organisations, whilst also gaining first hand experience of human rights law in practice." "Vous souhaitez vous offrir une parenthèse utile? Goûtez à la logistique des Grenoblois de Projects Abroad.Ils proposent des missions de volontariat ouvertes à tous et extrêmement variées : projet humanitaire en Inde,protection de l'environnement en Afrique du Sud,enseignement au Nepal ou encore archéologie sur les sites incas au Pérou.Les volontaires choisissent leur date de départ,la durée (1 mois minimum),la destination et le projet." "I want to travel overseas!" "Do you want to do something useful during your break? Try the destinations Projects Abroad in Grenoble has to offer. They have a variety of volunteer opportunities ranging from volunteer work in India, conservation in South Africa, teaching in Nepal, and excavating Inca sites in Peru. Volunteers choose their departure date, the length of stay (one month minimum [sic]), the destination, and project." "Projects Abroad is another good online resource, especially for gappers looking for a volunteer expedition. It offers a heap of different experiences and provides online application forms to get the ball rolling. The Projects Abroad website has details of holidays including a Mexican turtle conservation project and fossil digging along the Inca Trail to Peru. Whether you'll be painting classrooms in a school or harvesting tomatoes in a remote field, the website gives you a good indication of what you've signed up for. " “Projects Abroad, an England-based volunteer group, held an interest meeting Monday in the Baylor Sciences Building. Program adviser Jacob Lowe spoke to students about Project Abroad's goals, which are helping others, helping students learn and exploring new places. “Varios anos despues, trabajando para ‘Projects Abroad’ en el Valle Sagrado de los Incas, Cusco, ya casado y con familia tenia menos opotunidades para realizar mi pasatiempo favorito, sin embargo debido al trabajo que comenzo en el 2005, decidimos en el proyecto, combinar las actividades del desarollo communal, con el estudio arqueologico, asi retome las largas caminatas de exploracion. "They offer a diverse range of teaching, care, conservation, medical, journalism and work experience projects, plus the opportunity to become part of one of our [sic] local communities overseas." "Conservation in Peru is a project for the more adventurous. Access to the lodge is a two-hour riverboat journey from the town of Puerto Maldonado. You will be living with up to 30 other volunteers and a resident spider monkey! Taricaya lodge is basic, but clean and comfortable."